HSPiP is appearing with ever-greater frequency in academic and patent literature. 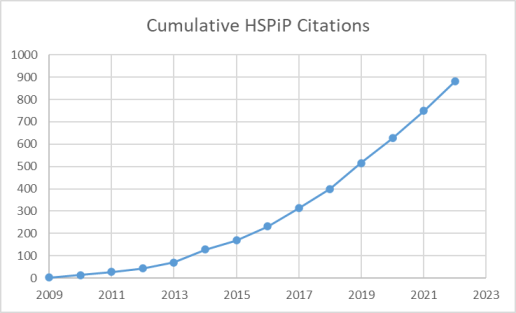 The graph shows the growth of citations using a Google Scholar search for the term "HSPiP Hansen". Like all such searches, some references are missing and some unintended ones are included. But it gives a good idea of how HSPiP is appearing in more and more scientific articles. A similar search (not shown here) within Google Patents yields >300 patents that site the package.